The KTM 1290 Super Duke R has been the subject of much media attention since its launch in 2014, winning “Motorcycle of the Year” from multiple publications and earning praise across the globe. Does it deserve the hype? We spent an afternoon on one to find out and to see exactly where this bike stands among the current crop of exotic supernakeds. The first thing that hit me about this bike is how easy it is to ride. The riding position is very upright, feeling somewhere between the Yamaha FZ-09 (very upright) and the Aprilia Tuono V4 (feet and bars more forward). It’s on the tall side but at 6’0, I was able to flat foot with a bit of room to spare. The seat is comfortable, with stiff yet supportive foam that allows for a little room to move around. The bike weighs in at 471 lbs (wet) so it’s no ballerina in this class but carries its weight well, never feeling top-heavy (for reference, the Aprilia Tuono V4 weighs 462 lbs, the BMW S1000R is 450 lbs and the Ducati Monster 1200S , 462 lbs -all wet weights). Bars are wide, controls well laid-out, clutch action is light and engagement is gradual. Even in sport mode, throttle response is linear and fueling is good (much better in than Ducati’s comparable large V-Twins in stock form). With electronics enabled, you could hand the keys for this bike to just about anyone and they would have no problem riding it casually. It just feels immediately friendly and familiar -very much the opposite of what “the beast” monicker this bike carries would have you think. Fit and finish are good, mirrors being particularly solid and controls providing good feedback. We were not fans of the shiny black finish on the tank which looks scuffed on every example we’ve seen in showrooms and in the wild -but this is a minor gripe on an otherwise gorgeous (but expensive) machine. 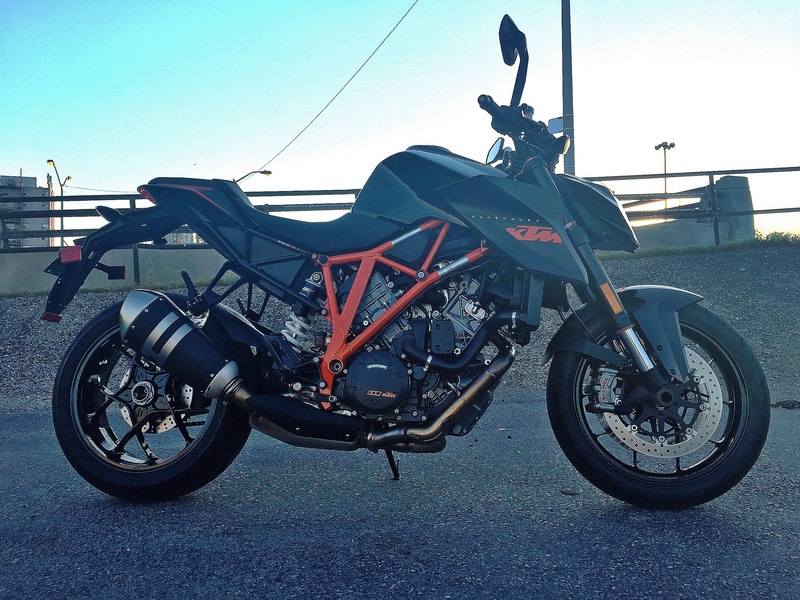 Street price for the 2016 base model is about $19K CDN and over $20K for the special edition that features a unique livery and select parts from the KTM Powerparts catalogue (exhaust, seat, levers, anodized bits, etc). Once underway, the suspension begins to reveal its preference -set from the factory to be rather soft and easily absorbing all of the frost heaves and potholes commonly found in urban jungles. More on suspension later. But I know what you’re all wondering as you read this: what about the motor? What about all that torque? Well, avid readers, I’m here to tell you that every advertised foot-pound (93 lb-ft at the wheel) is there and ready for action (in Sport riding mode to be clear, as other modes subdue throttle response and/or max HP). From the moment the clutch is out, there is just endless torque available and it comes on in a very linear fashion, making the bike very tractable and easy to ride at low speed and at any rpm. With traction control enabled, it’s actually difficult to get the bike out of sorts (try as we might) and the electronics do a good job of eliminating wheelspin and front end lift, despite 152 HP being available (at the wheel). MTC is KTM’s traction control and can be set either “on” or “off”. 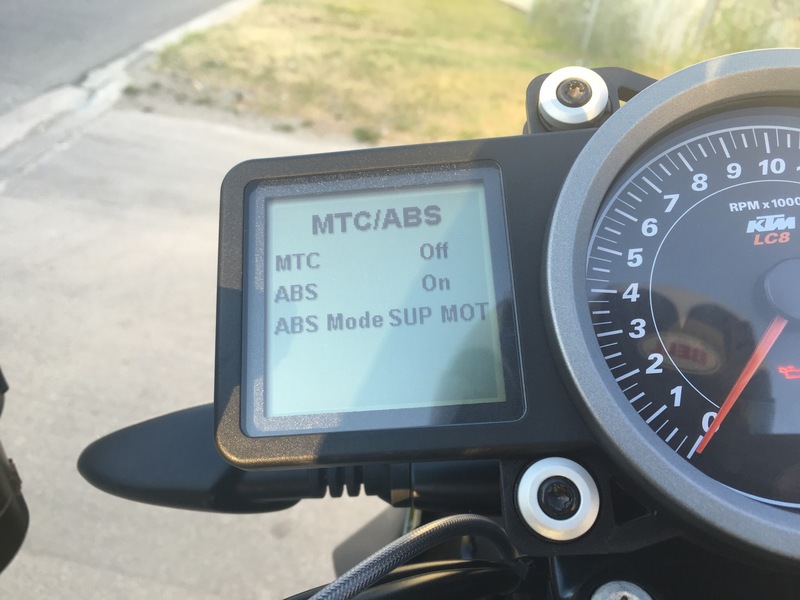 ABS has 3 modes, “on”, “off” and “Super Moto”. After about a half hour of getting familiar with the bike in sport mode and with traction control and ABS fully enabled, I pulled over and disabled TC, then put ABS into Super Moto mode -this allows the rear tire to lock up under braking but keeps ABS enabled for the front. It’s worth noting that the traction control on this motorcycle is on the primitive side, compared to Aprilia, BMW or Ducati’s offerings: it’s either everything on, or everything off on the KTM and there is no way to adjust sensitivity of intervention level. For novice or intermediate riders, this may not be an issue, but advanced riders will want more control over the system. In everyday riding, it would probably make sense to just leave the electronics on but on the racetrack, it would be more of a struggle as having no electronics whatsoever could be a handful with so much torque on tap and the bike leaned over constantly. I digress -most people who buy this motorcycle probably will not be taking it to the racetrack but even for aggressive street riding, I would ride this bike with traction control completely disabled. Another gripe that became apparent is that the electronics system resets itself every time the bike is turned off, so stopping for fuel or lunch will require you to go back through the (albeit intuitive) menu system and set everything back up, every time. That is, unless you buy a $125 peripheral “accessory dongle” from KTM, and even then, you can only get the bike to retain TC and ABS modes, not ride mode. For a $20K bike, I simply cannot fathom this oversight on KTM’s part. Get used to toggling ride modes, TC and ABS settings as you’ll be doing it a lot. With TC disabled and moving to a private road, “the beast” side of the 1290 SDR now revealed itself. First gear wheelies are, as expected, violent and not for the faint of heart. Accelerating just a little too abruptly in first gear will cause serious loss of contact with the pavement (front or rear tire, depending on available grip) as I experienced during a routine traffic merging exercise. Second gear wheelies are the sweet spot, being able to loft the wheel from just about anywhere in the rev range. 3rd gear wheelies are also allegedly possible (we ran out of private road to test this) and for those who are open to clutching up, there’s even more fun to be had beyond 3rd gear. A non-adjustable steering damper up front is a welcome addition from the factory and keeps tank slappers and wobbles at bay. The new-found ability to lock up the rear with ABS in Super Moto mode was promising, although the rear brake pedal felt wooden, making it hard to modulate pressure on this heavyweight, quazi-Super Moto. With this newly discovered performance, I explored the bike’s cornering ability under load and found the limits of the suspension, particularly the front end. The soft factory settings are partially responsible for this but front and feel was a little vague at speed and did not inspire nearly as much confidence as I would have hoped. Whether or not the stock WP suspension has enough adjustment range to really make up for this is unknown, but one thing is for certain, there is a bias for all-day comfort which reveals itself under more aggressive riding. This extends to the front brakes, where stopping power is definitely on par with the motor’s output but still short from legendary, perhaps held back again by the softly sprung front end. Knee down or leg out? The choice is yours. It’s also worth noting it that I was more comfortable cornering this bike using a Super Moto “leg out” style than a GP “knee out” style. This became obvious on the repeated highway on and off ramps (“cloverleafs”) used to test cornering ability at varying speeds. Because the front end was set up more softly, this would make sense as the SM style weighted the front end and provided better feel (as well as some insurance, should that back end step out). In terms of the limits of the motor, there is really more power here than any sane person could want. Full stop. The motor definitely favours being short to mid-RPM shifted as there is little reward to be found by reaching for the 10,250 RPM redline. At about 7,000 RPM, the big V Twin begins to feel notably less smooth, further negating incentive to wring it out. I saw the red flashing shift light quite a number of times before realizing that there was no real benefit in exploring that part of the tach. Because you are riding the bike so low in the rev range, speed creeps up very easily and I caught myself well above normal riding speed on a few occasions, in disbelief that I was going so fast with the motor barely breaking a sweat. Torque is a wonderful thing. The big V-Twin cruises easily at highway speeds. Wind protection is standard for a naked bike (meaning there is none), so invest in a good helmet. This is perhaps the most important characteristic to take note of with the 1290 SDR, compared to its class rivals. Where motors like the BMW S1000R come alive at the top of the rev range, the 1290 is much more at home riding its big fat torque curve down low, emitting a pleasant growl from the stock exhaust can and letting you know it’s happy there. Whether or not this is desirable to you in a power plant and in a motorcycle altogether will largely depend on your preference for power delivery and riding style. When you look at the new applications KTM has found for this motor in the 1290 Super Adventure and upcoming 1290 Super Duke GT, it makes total sense as this mill would be well suited to touring applications. 2017 KTM Super Duke GT. So, with all that said, what do we have here? Well, I can confidently say that the KTM is the most well-rounded super naked of the 2016 crop (and perhaps of all modern super nakeds). Out of the box, you get a bike that can do many things quite well, from commuting to spirited back road sessions, touring and even light track duty. It could certainly be tuned to increase its bias for performance, comfort or touring. There are more specialized weapons in other manufacturers stables: the Aprilia Tuono V4 and BMW S1000r are more athletic with their superbike-derived chassis and screamin’ power plants (you can soon add the Yamaha FZ-10 to that list). Ducati’s Monster 1200S, perhaps more elegant and charismatic with its Italian flare and the Kawasaki Z1000 which can be had for some much less ($) that you’d have enough money left over to buy a 2nd bike. Bikes in this category have gotten so good that it’s more about what moves and excites us as riders, not about specs or rankings. KTM’s marketing team fooled us into thinking they had created “the beast” -an extreme or evil motorcycle when in fact, the big Duke is the opposite: sophisticated, approachable and easy to ride. Our verdict: the KTM 1290 Super Duke R is a unique and highly desirable, versatile machine that can be as composed or boisterous as you need it to be.